ACEP is an active force in Washington, DC, working on important issues that affect the practice of emergency medicine and emergency medical care. • To view ACEP's press release "ACEP Statement on Future Health Care Legislation," please click here. • To view ACEP's press release "New Public Poll: Emergency Care Is The Most Essential Health Benefit To Cover," please click here. • To view ACEP's press release "Nation's Emergency Physicians: Senate's Alternative to Affordable Care Act Is a Huge Disappointment," please click here. • To view ACEP's press release "Nation's Emergency Physicians Urge Congress To Vote "No" on American Health Care Act," please click here. According to the CDC and Census data, the 2016 uninsured rate in the United States reached a record low of 8.6 percent. That rate equates to more than 21 million fewer individuals without health insurance than existed in 2010. As emergency physicians, we know better than most that coverage does not equal access, but this improvement should not be dismissed and it is imperative that any discussions to repeal and replace Obamacare include policies that will provide coverage and access to quality health care. No one in this country should ever be without necessary care because of an inability to afford it and no one should be forced into bankruptcy or financial ruin because of necessary medical care. Maintain emergency services as a covered benefit for any insurance plan. Ensure the federal Prudent Layperson Standard extends to Medicaid fee-for-service and that compliance measures are in place for all other health plans. Require health insurance transparency of data used to determine in- and out-of-network reimbursement rates for their patients' medical care. Ensure appropriate reimbursement rates for emergency services. Eliminate need for prior authorization for emergency services and guarantee parity in coverage and patient co-payments for in- and out-of-network emergency care services. Retain protections for pre-existing conditions, no lifetime limits and allowing children to remain on their parents' insurance plan until age 26. Enact meaningful medical liability reforms, including protections for physicians who provide federally-mandated EMTALA-related services, care for patients in a federally declared disaster area and who follow clinical guidelines established by national medical specialty societies. Ensure any continuation or expansion of Health Savings Accounts (HSAs), Health Reimbursement Accounts (HRAs), Association Health Plans (AHPs) and Individual Health Pools (IHPs) provide meaningful health insurance benefits and coverage for individuals and families, including access to emergency care services. Repeal the Independent Payment Advisory Board (IPAB) and the excise tax on high-cost employer health benefit plans. Delay repeal of the Center for Medicare and Medicaid Innovation (CMMI) until at least 2020 or amend to eliminate mandatory provider participation in Medicare models. This will allow an adequate transition period for the Transforming Clinical Practice Initiative (TCPI) grants aimed at lowering costs, improving health outcomes and delivering more effective care. Acknowledge the role of freestanding emergency centers and other health care delivery models as crucial to encouraging coverage innovation. Protect the most vulnerable populations in this county by making sure Medicare, Medicaid and CHIP remain available and solvent for current and future generations. To view the full letter, please click here. To view ACEP's letter of support for Rep. Tom Price, M.D. to become the next Secretary of the Department of Health and Human Services, please click here. 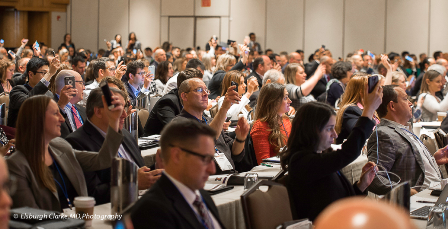 Emergency Physicians are Coming to Capitol Hill: Live "Call-to-Action"
ACEP President Dr. Rebecca Parker will host a live "call-to-action" powered by Phone2Action alerting Members of Congress and their staff that emergency physicians are in Washington, DC. 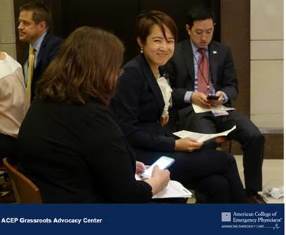 In just a few minutes, simply by using your smartphone, you will connect with legislators instantly via email, Twitter, and Facebook. Please make sure that your phone is charged. Visit with your Members of Congress during ACEP’s Lobby Day on Capitol Hill and educate them on emergency medicine's most pressing issues. Soapbox Consulting is scheduling visits for all registrants. You will receive an e-mail from Soapbox this Friday, March 10 with instructions on how to access your schedule. ACEP’s Lobby Day concludes on Tuesday evening at the Congressional Reception in the U.S. Capitol Visitor Center: Congressional Auditorium Area - Lower Level. Legislators and key staff are invited to attend. The U.S. is facing a prescription opioid abuse and heroin use epidemic. Emergency physicians see first-hand the toll these drugs take on individuals, families and communities. To help solve this problem, emergency physicians rarely prescribe extended release opioids or prescriptions for more than several days. Furthermore, ACEP has been educating its members on safe prescribing guidelines for years and these efforts have shown great success. According to a 2015 American Journal of Preventive Medicine (AJPM) study, the largest percentage drop in opioid-prescribing rates between 2007 and 2012 occurred in emergency medicine (-8.9%). ACEP supports evidence-based, coordinated pain treatment guidelines that promote adequate pain control, health care access and flexibility for physician clinical judgement. Medical specialty societies should be the primary sponsors of these guidelines. ACEP has been actively engaged in developing pain treatment guidelines with the AMA, CDC, FDA, ONDCP and others and creating additional federal work groups or task forces to develop such guidelines would be duplicative. Safe harbor protections should exist for prescribers who follow pain treatment guidelines. ACEP supports effective, interoperable and voluntary state prescription drug monitoring programs (PDMPs) that push prescription data to emergency department providers, rather than requiring them to separately sign into and pull the data from the PDMP. Reauthorize the National All Schedules Prescription Electronic Reporting (NASPER) Act. ACEP supports state and local emergency department efforts to develop innovative programs to decrease opioid prescribing and use, including initiatives such as the state Emergency Department Information Exchange (EDIE) in Washington, Oregon and California, as well as efforts in New Jersey to use alternative, non-opioid pain management protocols supplemented with patient support networks. Alternatives to opioid pain management must be easily accessible to patients, including adequate coverage by insurance companies. ACEP supports physician prescribing of naloxone to at-risk patients (per SAMHSA recommendations), naloxone availability for first responders, and education of overdose recognition and safe naloxone administration by non-medical providers. This should be paired with legislation that would make health care providers and lay users of naloxone immune from liability for failure or misuse of bystander naloxone. ACEP supports physician co-prescribing of naloxone in conjunction with an opioid prescription for patients at an elevated risk for an intentional or unintentional drug overdose. ACEP opposes non-evidence-based public or private limits on prescribing opiates or mandatory opioid-related CME. ACEP supports entitlement pharmacy/physician lock-in programs that account for emergency medical care when a beneficiary is away from their home providers. ACEP supports increased availability and use of prescription recovery sites/programs. ACEP supports expanding manufacturing of opioids with abuse-deterrent properties. ACEP supports partial filling of a Schedule II prescription at the request of the practitioner who wrote the prescription for the patient. ACEP supports increasing the caps for medication assisted treatment by providers who are appropriately trained to dispense narcotics for maintenance/detoxification. ACEP supports enhancing NIH research on the understanding of pain and the development of new therapies. ACEP supports expanded use of drug/treatment courts that balance supervision, support and encouragement as an alternative to the criminal incarceration. ACEP supports modifying patient satisfaction surveys (HCAHPS/EDPEC) to remove the subjective pain questions and develop more objective measures for identification and treatment of pain. The Health Care Safety Net Enhancement Act will encourage physicians and on-call specialists to continue their lifesaving work and ensure emergency medical care will be available for your constituents when and where it is needed. Specifically, the legislation addresses the growing crisis in access to emergency care by providing emergency and on-call physicians who perform EMTALA-related services with temporary protections under the Federal Tort Claims Act. EMTALA, the "Emergency Medical Treatment and Labor Act," is a federal law enacted in 1986 that requires hospital emergency departments and its physicians to provide a medical screening exam for all patients, regardless of their insurance status or ability to pay. If an emergency medical condition is discovered, then medical treatment must be provided on-site or the patient is transferred to a facility that could provide the necessary treatment. The nature of emergency medicine is providing care to patients who have serious injuries or illnesses, with whom we have little or no relationship and, at best, a limited ability to access their medical history. For these reasons, emergency and other on-call physicians have much higher liability exposure and subsequent premiums. Providing liability protection to physicians for the federally-mandated EMTALA services rendered will help ensure emergency and on-call physicians remain available to treat patients in their communities. Otherwise, we will continue to see sharp declines in on-call specialist availability and the relocation of emergency physicians to areas of the country where the liability environment is more favorable. During the 112th Congress, the House version of this bill (H.R. 157) was approved by voice vote as an amendment to H.R. 5 in March, 2012. The Senate did not take action on H.R. 5 before the end of the session. View ACEP's full issue paper here. Please click here for a list of House co-sponsors. Please click here for a list of Senate co-sponsors. Please contact ACEP's Congressional Affairs Director Brad Gruehn at bgruehn@acep.org or (202) 370-9297 for more information. Pending federal regulations threaten a longstanding practice that has allowed Emergency Medical Services (EMS) personnel to administer controlled substances to patients who are suffering from severe pain or experiencing seizures, for example. This practice will soon be prohibited unless the nation's Controlled Substances Act is amended accordingly. To address this problem, Rep. Richard Hudson (R-NC), along with six original co-sponsors including Reps. Raul Ruiz (R-CA), Joe Heck (R-NV), G.K. Butterfield (D-NC), Steve Cohen (D-TN), Blake Farenthold (R-TX) and Bruce Westerman (R-AR,) introduced bipartisan legislation, “Protecting Patient Access to Emergency Medications Act” (H.R.4365). The legislation will allow EMS agencies to continue using standing orders from their medical director to administer approved medications to their patients under the Drug Enforcement Administration (DEA). The legislation is strongly supported by ACEP and five other national organizations representing Emergency Medical Services (EMS): the American Ambulance Association, Association of Air Medical Services, the Association of Critical Care Transport, International Association of Fire Chiefs (IAFC), the International Association of Fire Fighters (IAFF), National Association of EMS Physicians, National Association of Emergency Medical Technicians and the National Association of State EMS Officials. Click here to see ACEP's Press Release. To read a summary of H.R. 4365, please click here. To view a H.R. 4365 section-by-section, please click here. ACEP President Dr. Jay Kaplan will introduce attendees to a brand-new advocacy platform powered by Phone2Action. In just a few minutes time, simply by using your smartphone, you will connect with legislators instantly via email, Twitter, and Facebook. Make sure your phone is charged and get ready to communicate with Capitol Hill like never before. 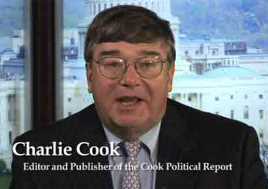 When Charlie Cook makes a pronouncement based on his analysis of the political scene in America, people who want to be “in the know” sit up and listen. For more than two decades he has been Washington’s most trusted – and most accurate – voice on all things political, whether it’s the outcome of a Congressional, gubernatorial, or presidential election. 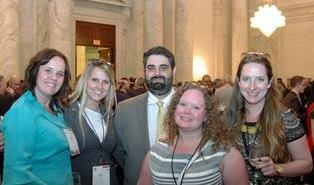 Visit with your Members of Congress during ACEP’s Lobby Day on Capitol Hill. Soapbox Consulting is scheduling visits for all registrants. You will receive an e-mail from Soapbox this Friday, May 13 with instructions on how to access your schedule. ACEP’s Lobby Day concludes on Tuesday evening at the Congressional Reception in the Kennedy Caucus Room of the Russell Senate Office Building. Legislators and key staff are invited to attend. If you have any questions, please contact Jeanne Slade at (202) 728-0610, ext. 3013 or jslade@acep.org or Gabrielle Szlenkier at (202) 728-0610, ext. 3020 or gszlenkier@acep.org. ACEP supports H.R. 2646, the "Helping Families in Mental Health Crisis Act of 2015," introduced in the House by Representatives Tim Murphy (R-PA) and Eddie Bernice Johnson (D-TX) and S. 1945, the "Mental Health Reform Act of 2015" introduced in the Senate by Senate by Senators Chris Murphy (D-CT) and Bill Cassidy (R-LA). For years, state support for mental health resources has been on the decline and services for psychiatric patients in the United States are simply inadequate. As a result of this diminishing support, psychiatric patients are more and more often turning to emergency departments for their acute care needs. Unfortunately, it takes three times as long to find an inpatient bed for a psychiatric patient rather than a medical patient after the decision to admit has been made. These psychiatric patients require more physician, nurse and hospital resources than other patients and, thus, diminish our ability to evaluate and treat other medical patients who are awaiting emergency care services. The prevalence of mental illness in this country, combined with a lack of resources to care for these individuals in the most appropriate setting, is a national crisis. Systemic changes are needed in the way individuals with mental illness are cared for in this country. In order to help ensure that resources are made available to conduct vitally-needed research on this issue and to fund additional inpatient and outpatient treatment beds with the corresponding professional staff, ACEP supports H.R. 2646, the "Helping Families in Mental Health Crisis Act of 2015," introduced by Reps. Tim Murphy (R-PA) and Eddie Bernice Johnson (D-TX), and S. 1945, the "Mental Health Reform Act of 2015," introduced by Sens. Bill Cassidy (R-LA) and Chris Murphy (D-CT). Efforts to implement mental health parity in health plans. H.R. 2646 and S. 1945 are not the only mental health bills that have been introduced in the 114th Congress, but these bills represent the most comprehensive efforts to reform a significant number of mental health programs. Other provisions from bills such as S. 1893, the "Mental Health Awareness and Improvement Act of 2015;" H.R. 1854/S. 993, the "Comprehensive Justice and Mental Health Act of 2015;" and S. 2002, the "Mental Health and Safe Communities Act of 2015" should also be carefully considered when the House and Senate advance their mental health reform proposals. To read ACEP's support letter for H.R. 2646, click here. To read ACEP's support letter for mental health reform to the House Energy and Commerce Committee, click here. Please contact ACEP's Congressional Affairs Director Brad Gruehn at bgruehn@acep.org or (202) 262-2090 for more information. With the release of the 2006 Institutes of Medicine (IOM) report, members of an ACEP/SAEM Task Force collaborated with the National Institutes of Health (NIH) to advance emergency care research. This collaboration, and additional efforts by emergency medicine advocates, resulted in a number of developments, including the NIH Emergency Medicine Research Roundtable reports released in 2010; the awarding of the first national K12 grant program by the National Heart, Lung and Blood Institute specifically for the career development of emergency medicine researchers in 2011; and the establishment of the Office of Emergency Care Research (OECR). Emergency medicine has been shown to directly affect the quality and duration of patients’ lives. ACEP urges Congress to promote the mission of OECR to coordinate and foster clinical and translational research that improves patient care in the emergency setting by ensuring adequate funding is available for this critical research that crosses the whole spectrum of medicine. In addition to emergency care research, ACEP supports programs that will enhance the delivery of emergency medical services through trauma centers and the highly specialized trauma teams that staff them, as well as the development of regionalized systems of emergency care that ensure timely access for injured patients to the most appropriate facilities. To view ACEP's 2015 Advocacy Manual, please click here. For 13 years, ACEP along with the American Medical Association and other physician organizations have been urging Congress to repeal the fundamentally flawed Sustainable Growth Rate (SGR) formula used to reimburse physicians for their Medicare services. After numerous "Calls for Action," Leadership and Advocacy Conference meetings, ED visits, in-District meetings, calls, advocacy efforts by the Public Affairs staff in D.C., and 17 temporary patches to avert physician payment cuts, the U.S. Congress overwhelmingly approved legislation to repeal the SGR and replace it with a system that rewards quality, efficiency and innovation. The House passed the bill, H.R. 2, the "Medicare Access and CHIP Reauthorization Act" (MACRA), on March 26 by a vote of 392-37 and the Senate approved the bill on Tuesday night by a vote of 92-8. President Obama signed the bill into law on April 16, 2015 (P.L. 114-10). ACEP will be closely monitoring the implementation of H.R. 2 over the next few years as the regulatory agencies provide additional details of how the Merit-Based Incentive Payment System (MIPS) will be executed. Fully funds the Children's Health Insurance Program (CHIP) for an additional two years (through September 30, 2017). This is a significant victory for ACEP and organized medicine! On April 16, 2015, President Obama signed H.R. 2, the "Medicare Access and CHIP Reauthorization Act" (MACRA). The legislation extended CHIP funding for an additional two years through Sept. 30, 2017. To read detailed summaries of the CHIP provisions, please click here. This is a significant victory for ACEP and organized medicine. Of particular concern to ACEP was the creation of the Independent Payment Advisory Board (IPAB) under the 2010 Affordable Care Act. If implemented, IPAB will have 15 full-time members, appointed by the president and confirmed by the Senate, who once approved, will have no accountability to Congress, health care providers or the public. Furthermore, only a minority of the commissioners can be health care providers, and none of them may be practicing physicians. IPAB decisions on how to implement Medicare cuts would force Congress to adopt the recommendations or find comparable savings, and without congressional action, the cuts will automatically be implemented by Health and Human Services. Since hospitals and nursing homes (Medicare Part A) are not subject to IPAB’s cost-cutting recommendations until fiscal year 2020, ACEP warns that IPAB’s mandate to reduce spending could be primarily focused on physicians and other outpatient services (Medicare Part B), which would potentially reduce physician payments even further than are already scheduled due to the flawed Sustainable Growth Rate (SGR) formula. This could cause even more health care providers to question the value of participating in the Medicare program. The threat of further cuts to physician Medicare reimbursement on top of sequestration and the unstable SGR are not sustainable. Repeal of the IPAB is an essential step in providing stability to the Medicare system for providers and their patients. Several bills were introduced in the 113th Congress that would expand the number of Medicare-supported GME slots by 15,000 over five years. While these bills received significant bi-partisan support, they were not considered in the House or the Senate because of the potential cost (estimated at $10 billion) to expand the GME program. However, the Association of American Medical Colleges (AAMC) projects a physician shortage of 131,000 by 2025 (even split between primary care and medical specialists). The Medicare GME cap, which is still based on the number of residents that each hospital trained in 1996, has not be lifted or adjusted since 1997. The House and Senate have begun the process of examining ways to accelerate the discovery, development and implementation of cures and treatments as well as overhaul the FDA approval process for new drugs and medical devices. The goal of the Congressional proposal(s) is to establish rules that would bring new, personalized drugs and devices to market more quickly. The House Energy and Commerce Committee Chairman Fred Upton (R-MI) and Ranking Member Rep. Diane DeGette (D-CO) recently released draft legislation entitled, "21st Century Cures," to streamline the approval process of drugs and medical devices. The bill also may include provisions to expand Medicare physician reimbursement when providing tele health services. In the Senate, this effort is being led by the Senate HELP Committee. Two of the committee members, Chairman Lamar Alexander (R-TN) and Sen. Richard Burr (R-NC), released a January 2015 report titled, "Innovation for Healthier Americans," on the challenges to getting safe treatments, devices and cures to patients more quickly and effectively. The two committees are soliciting comments to enhance the draft legislation. Furthermore, President Obama has stated his support for these goals as well. Congress provided funding for the Obama Administration’s request at the end of 2014. There may be additional efforts to subsidize the development of vaccines, streamline treatment protocols, impose travel restrictions/quarantine, etc. A complete guide for ACEP members to help you navigate the Halls of Congress, understand the legislative process, get to know your legislators and their staff, and tips and techniques to help you maximize your federal advocacy efforts on behalf of emergency medicine. The grades have been tabulated, and the nation's emergency health care system has received its ranking with the release of the third "National Report Card on the State of Emergency Medicine"
Help us make a difference for emergency medicine and patients. Contact your legislators now!